Utilization of multi-methodology algorithms in medical practice today: The case for integrating diverse diagnostics information to optimize linkage to care. Achieving success in clinical diagnostics can require integration of in vitro and in vivo testing methodologies, complex panels of assays, data algorithms and IT solutions supporting delivery of clinically actionable reports. Though proprietary biomarkers or unique automated systems have traditionally defined a company’s competitive positioning, increasingly companies are finding they must offer well-validated testing algorithms and wrap-around IT solutions to meet market expectations. 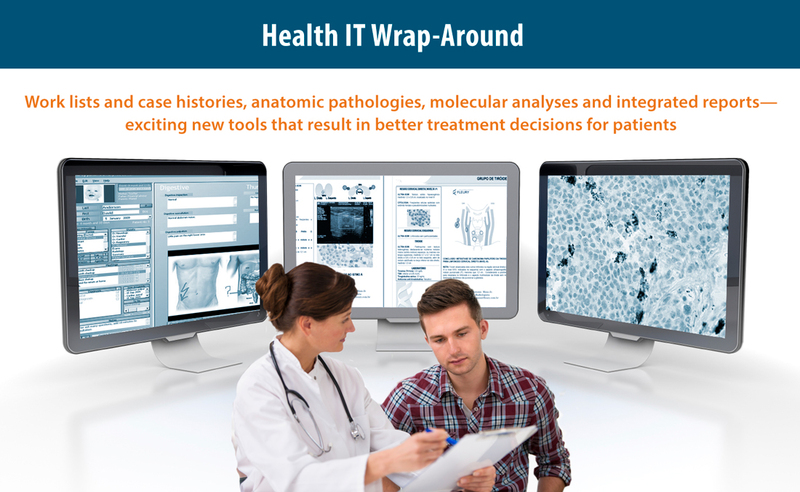 Comprehensive testing and treatment approaches today can involve a dizzying array of imaging, protein, nucleic acid and other test results, coupled with clinical observation, for complete disease diagnosis, staging and monitoring. However, this growth in testing complexity has not been met by corresponding advancement in physician education or in the availability of expert intermediaries who can help to position the results for interpretation by treating physicians. Therefore, simplified reporting solutions are required. Integrated data reports are critical drivers of success. To compete successfully in the fast-moving “omics” segment of medical practice, developers must carefully consider how data is collected and presented in a manner familiar, clear and concise for use by treating physicians, laboratorians, patients and caregivers. Whether multi-marker results from a single instrument platform or from several platforms are required for improved disease diagnosis and treatment monitoring, companies must use well-validated algorithms and data reporting approaches to integrate data and present results in an easy to interpret report. Understanding the disease process and how a complex set of raw results can be combined using proprietary algorithms and well-organized reports to aid the clinician in providing personalized medical treatment can truly differentiate a company and will certainly be required for future-state applications. Halteres Associates assists clients with understanding current and future medical practice in target clinical segments and how they might best develop and deliver solutions that satisfy the needs of treating physicians and their patients.